Your dog a little tough on toys? Buy them one of our indestructible dog toys. 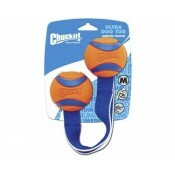 PetHangout playfully offers tough tug and pull toys as part of our Dog Toys Collection. This line of toys let you play with your pet inside or outside. Enjoy the beautiful sunshine with your dog and take one of these wonderful toys along. Your and your pet will have bunches of fun! Fetch - Throw this spinning squeaker toy to get your dog jumping for joy. Tugs - Enjoy playing tug of war with your dog with this double sided tug toy. Braided & Stretchy - This braided zebra even helps clean your dog's teeth. Questions on our indestructible toys for dogs? Please drop us a note or call 877-860-1278. We act tough to find your answers! Air Kong Squeaker Football Dogs were born to chase and this toy will give the..
Air Kong Squeaker Spinner What is more fun than a boomerang? A boomer.. Cool Kong Retriever Toy Does your dog love to retrieve? PetHangou.. Dental Kong Toy with Rope Can your dog chew their way to shiny, clean tee.. Double Tug Toy Wanna play tug of war with your dog? We have ..
K9 Tuff Cow Dog ToyPetHangout is feeling very proud of our K9 Tuff Cow Dog Toy. ..
Katie's Bumpers Sqwuggie Well, this may just be the toy ..
Kong Ballistic Tug Looks can be deceiving - this toy looks super plush but is..
Kong Crossfit Football Toss or tug this fun toy with your dog!P..
Kong Daisies OwlPetHangout is hotting over our Kong Daisies Owl. Does your dogg..
Kong Jumbo Lion A super stretchy dog toy for your favorite buddy! ..
Kong Koala Dog ToyPetHangout is loving our new Kong Koala Dog Toy. Ar..
Kong Safari Giraffe Bring some of Africa into your pet's toy co..
Kong SqueakAir Oval Dog ToyPetHangout is making your pup a happy camper with our Kong Squea..
Kong Squeeze Ball Interactive play with your dog just went up a level or two!..